then what - sterile neutrinos? axions? There are many alternatives at many different mass scales. Besides, even when they hit the neutrino wall it won't mean that WIMPs are excluded but that they are hard to find. Besides other DM candidates, if WIMP detection reaches a practical limit, I expect increased interest in MOND and related ideas. I'm aware of the problems with modified gravity theories, but people work on the hypotheses that they're able to work on. If people can't search for WIMPs but they can point telescopes at the sky then they'll point telescopes at the sky. Maybe they'll also do some elaborate experiment with high-precision measurements on a big spinning disk or whatever, to see if there are deviations from Newtonian dynamics. Anon #2. I think that looking at nuclear recoils is not the best way to study these neutrinos. Most current neutrino experiments use charged current interactions and my guess it'll always be a better way. But I don't have any numbers at hand. Anon #1, as above, it's a different process one is looking at for neutrinos. Directional detection techniques for nuclear recoils are still in infancy, and it's not clear they can scale up to 10t experiments. Bit nobody says it's impossible either. To the extent that WIMP is given its narrow technical meaning of a massive particle that interacts only via the weak force, I am entirely convinced that no such particle exists with what we know now. Any particle light enough not to be ruled out in the chart above (which excludes essentially all GeV to 100 GeV scale dark matter with a cross section of interaction at least as strong as an ordinary neutrino) would necessarily have shown up in weak force decays in particle colliders. Astronomy data already strongly disfavors collisionless cold dark matter in the WIMP mass ranges studied (let alone anything heavier) because it leads to a halo shape inconsistent with observation and implies too many satellite and dwarf galaxies. Likewise, dark matter particles in the 1 eV mass range or less (probably even 10 eV mass range) would act like "hot dark matter" and blur out most of the large scale structure in the universe that we do observe. 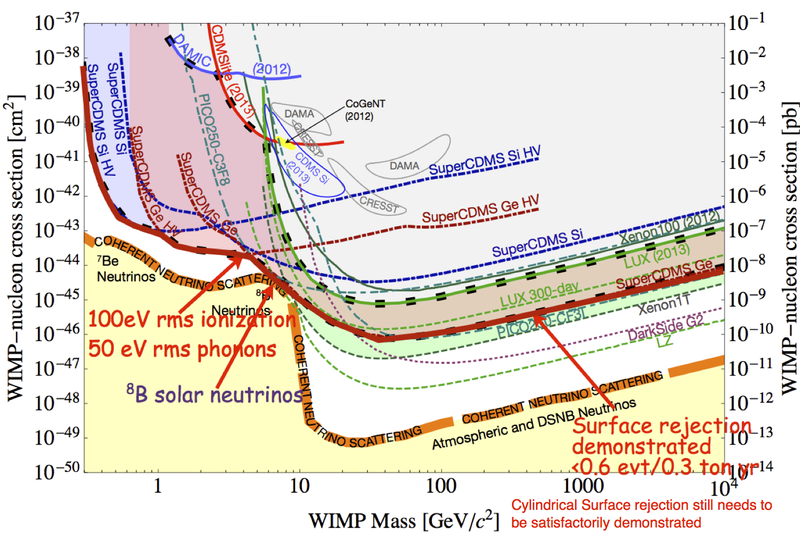 The real sweet spot for dark matter detection experiments is for particles in the keV range associated with warm dark matter, or possibly into the MeV mass range with sufficiently fine tuned self-interactions via some new massive boson on the order of 100 MeV in mass that doesn't interact via the ordinary weak force interaction of the Standard Model. It looks to me like it will be a very long time before particles fitting that preferred profile can be ruled out by direct detection experiments. I see. So the game can go on indefinitely. At what point does the hypothesis that WIMPs are the CDM become untenable? For researchers can always fall back on the plea: " Give me another decade of sensitivity. I know its got to be here somewhere!" I am quite sympathetic to this request based on my own work. I guess I'd just like to see statistical analyses (such as this) get more attention. Can we quantify our ignorance? I think the WIMP hypothesis can be abandoned either if DM is discovered in a different mass range, or if it it demonstrated beyond all doubt that WIMPs cannot explain the galactic dynamics. Not discovering them in direct detection is not enough, there are many WIMP models where the cross section on nucleons is predicted to be unobservably small. well, it happened to certain nuclear decay experiments - and after the downgrade they still won a nobel. not too bad a perspective. Jester, as I'm sure you're aware, the recent UCLA Dark Matter conference had several interesting presentations regarding the few-GeV gamma ray excess from the galactic center (see also 1402.6703). There also appeared to be a slight excess from dwarf galaxies, all apparently consistent with a 30 GeV-ish WIMP annihilating to bottom quarks. I'd be very interested on your take on this. Re your concluding phrase "sometime in the next decade it'll all come to a bitter end"... this is implicitly assuming that they're not going to get any positive WIMP signal before they hit the neutrino floor. Does this imply you've basically given up on SUSY WIMPs based on the LHC null results, or do you favour some fine-tuned non-detectable SUSY or something else ? Anon, the bitter end is just an educated guess :) I don't favor any particular WIMP or non-WIMP scenario at this point. Looks like CRESST plans to publish some new results that exclude the previous CRESST signal in a few days.